The objective of harvesting any type of forage for storage is to preserve resources produced in the summer months in order to provide winter feed for livestock when grazing is not feasible or accessible. It is essential to harvest forage at the appropriate time, based upon nutritional quality, forage yield and climatic conditions, and then to store it properly to reduce losses. Feed is the major input cost in cattle production, therefore producers must evaluate the cost of production for all stored forage systems. High quality hay is a highly digestible, palatable dry forage with sufficient nutrients to meet the nutritional demands of the livestock being fed. Hay harvested at the proper stage of plant growth and undamaged by weather provides nutrients at a relatively minimal cost compared to many other supplemental feeds1. Hay quality is determined by a combination of both physical factors and nutritional status. Stage of plant maturity at cutting is the most important factor influencing hay quality1. Young, vegetative forage is higher in protein and energy than older, flowering material. As forages mature, stem is increased in the total forage mass and the leaf-to-stem ratio is reduced. As a result, fibre increases while protein and digestibility decreases. Delaying hay harvest tends to maximize forage yield but results in considerably lower forage quality. Timing of cutting decisions must balance these variables – a compromise between quality and yield (Figure 1). Figure 1 – Changing values of forage quality compared to yield. Forage sampling and feed testing are essential tools for producers to evaluate quality parameters. While visual appraisal (i.e., forage colour, plant species, leaf/stem content) and knowledge of stage of maturity at cutting time are indicators of hay quality, they do not substitute for a feed test. It is important to not rely on averages and to test all feed sources annually. Legumes are normally higher in quality than grasses but within each there can be a wide range in quality2. Mixtures of grasses and legumes, when managed properly provide for high quality hay production. Grasses can improve the drying rate of mixed stands compared to pure legume stands. An effective hay harvesting system is designed to cut and conserve high-moisture standing forage using management practices to reduce field losses and spoilage losses due to microbial activity. 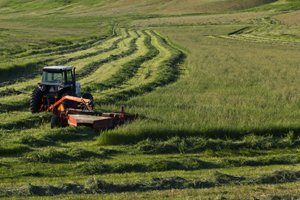 Fresh cut forages range from 70 – 80% moisture which must be reduced to “safe” levels prior to baling. The key to minimizing storage losses is to bale at moisture levels between 15% and 18% to prevent heating and mold growth. As bale size and density increases, proper baling moisture is more critical to prevent heating and deterioration in quality3. Rapid drying of hay shortens the harvest window, enhances forage quality, and reduces the chance for rain damage4. Initial drying of cut forage occurs through natural pathways, including stomata in the leaves and stems, and through parts of the plant that have been mechanically conditioned when cut. This initial loss of moisture is quite rapid, while later in the drying period the rate of water loss slows as osmotic forces hold water in the plant cells and weather conditions hinder water movement from the stem (Figure 2). Figure 2 – Moisture loss over time in cut and conditioned forage. Stomata are openings in the leaf tissue and stems which allow moisture loss to the air to cool the living plant and provide a path for carbon dioxide uptake from the air as the plant is growing4. Stomata open in daylight and close in darkness or when moisture stress is severe. Leaf tissue is high in water content but has a high surface-to-volume ratio and numerous stomata, which promotes rapid drying. Plant stems are covered by a semi-impervious waxy layer, have a lower surface-to-volume ratio and have fewer stomata than leaves. Conditioning the plant, by cutting with a haybine or mower-conditioner, enhances drying and promotes moisture loss by splitting, cracking or scraping the waxy layer of stems and creating new exits for water to leave the stem. Even after cutting, forage plants maintain tissue growth and plant function by metabolizing sugars and starches through a process known as respiration4. Respiration rate is highest at cutting and gradually declines until plant moisture content has fallen below 40%5, though microbial respiration may continue at lower moisture levels. Rapid initial drying to lose the first 20% of moisture will reduce loss of sugars and starches and result in more total digestible nutrients (TDN) retained in the harvested forage6,7. Plants reach a maximum starch and sugar content late in the afternoon4 obtaining the highest levels between 11 and 13 hours after sunrise8. Research has shown that although cutting reduces the sugar content through respiration losses, levels will remain higher in forages that are cut late afternoon as compared to when cut earlier in the day, provided that rapid initial dry down is achieved. The BCRC blog post and webinar, Tips for increasing sugar content in forages, provide more detailed information including management considerations and impacts on animal performance. 1) Cut to proper height – cutting height for alfalfa should be between two and four inches whereas grass or legume/grass mixtures should be cut to between three and four inches. Grasses generally require a slightly higher cutting height to protect energy reserves in the stem base, which is used for regrowth. Cutting too low may shorten the life of grass plants in the stand. These stubble heights also keep the swath (windrow) off the ground and facilitate air movement. If cut forage in a swath settles onto damp or wet ground, drying time increases as the forage gains moisture from the humid air near the ground as well as capillary action if it comes into contact with damp soil. 2) Condition properly – mechanical conditioning at cutting can nearly double the drying rate9. Proper conditioning occurs when the stems of legumes are scraped or broken every two to four inches and less than 5% of the leaves are bruised4. In general, roll conditioners are best suited for alfalfa and alfalfa/grass mixtures, while flail/impeller conditioners are better for grasses. 3) Lay hay in a wide swath – wide swaths reduce swath density, increase the crop’s exposure to the sun, and increase crop surface temperature, all factors that lead to more rapid drying of hay. 4) Rake at a moisture content that minimizes leaf loss – raking moves the forage crop off wet or damp soil and reorients the wet bottom layer toward the sun and reforms the swath, promoting air movement. To reduce leaf loss, rake alfalfa when above 40% moisture and when grass is above 25% moisture. Raking increases the rate of drying on the day of raking but following the initial raking, the resulting heavy swath can slow the drying rate. The goal when harvesting legumes, including crops such as alfalfa, red clover, and birdsfoot trefoil, is to maximize the economic yield of nutrients (forage quality) while ensuring stand persistency. The stage of maturity at which legumes are cut influences feed quality as nutritive value declines with maturity. Leaf loss during harvesting reduces protein content, while rain prior to baling reduces the levels of soluble carbohydrates due to leaching. Regardless of the harvesting and storage methods some dry matter and nutrient losses occur and will vary with management practices. Desired forage quality and the length of the cropping rotation dictates cutting frequency. Frequent cuttings produce high quality forage while less frequent cuttings generally result in increased stand longevity. Carbohydrates stored in the taproots and crowns are the energy reserves essential for winter hardiness, initial spring growth, and subsequent regrowth after cutting. Energy reserves are the highest when plants are in full bloom and lowest shortly after cutting when the plant is actively growing. Winter hardiness is a key factor influencing stand longevity. Legume varieties with early fall dormancy tend to be more winter hardy. Less dormant varieties tend to have faster regrowth with higher yield potential but are more susceptible to winter injury. Research is being conducted to identify genes that support late fall growth and winter survival of alfalfa (See BCRC Factsheet: Increasing fall productivity in winter-hardy alfalfa). Alfalfa is the most productive and widely adapted legume. Under good management it has good persistency and longevity. High quality alfalfa can be harvested when cut at the bud-to-early bloom stage. Risks to alfalfa stand persistence can be minimized by allowing at least one harvest during the growing season to reach 10% or greater bloom, along with high levels of fertility and proper timing of fall harvest, which allows higher energy reserves to accumulate in the roots. Compounds to reduce field curing time of forages include two types of products, both of which are applied through a spray system, however they each employ a different mode of action and are used at different stages of hay production10. Desiccants can be applied to legume crops (they are ineffective on grasses) at cutting time to reduce the time needed for curing and drying. Desiccant compounds (containing potassium or sodium carbonate) disturb the waxy cuticle of legume stems to allow the plant to dry faster. Effectiveness varies with climatic conditions with improved efficacy under good drying conditions as compared to poor drying conditions. Preservatives are applied at baling to prevent heating and spoilage when hay is baled at higher moisture levels. Moisture and temperature are the fundamental control variables for storage, and the role of a preservative is to prevent microbial growth and activity. Mold growth that occurs in baled forages increases dustiness, reduces palatability and can impact animal health. The use of preservatives for hay above 35% moisture is not recommended. The most effective preservatives for alfalfa are organic acids, primarily propionate (propionic acid) and acetate (acetic acid). Propionic acid is the most effective organic acid preservative for baling moist hay that is commercially available. Rates of propionic acid application vary depending on the moisture content of the forage. Acetic acid is about half as effective as a preservative and therefore requires twice as much product for equal preservation. As organic acids function as fungicides they must be applied to contact as much of the plant surface as possible, which is usually at the pick-up on the baler. It is important to note that organic acids can be corrosive to equipment and a neutralized solution is recommended. Anhydrous ammonia is an effective preservative for grasses. It can also be used as a source of non-protein nitrogen to improve the feeding value of low-quality forages, including straw, by increasing protein content and assisting in the breakdown of the fibre fraction of mature forages. The response to anhydrous ammonia is controlled by moisture content of the forage (minimum 10-12% moisture required, with ideal at 15-20%), the time of ammoniation, air temperature, and the amount of ammonia provided. Anhydrous ammonia must be applied at 2% of forage dry weight when used as a preservative for high moisture forages or applied at 3-5% of forage dry weight to improve the feeding value of low-quality forages. The ammoniation process can be accomplished by injecting into bales or released into a stack of bales covered and tightly sealed with plastic to make an airtight environment. For ammoniation to be effective the stack must be completely sealed for up to four weeks. Three to five days before feeding ammoniated forages, one end of the stack should be opened to allow any excess ammonia to escape. Note that anhydrous ammonia should not be used as a preservative on alfalfa because alfalfa is generally high in protein already, and the interaction between alfalfa and ammonia can cause toxic chemicals to form. Losses in quality and quantity result when baled forages are exposed to the weather. The amount of loss will vary depending on precipitation, storage site location and preparation, and the original condition of the bale. Understandably, losses are more significant in higher rainfall conditions than under drier environments. The external layer of a bale represents a substantial loss of yield and quality due to weathering. The size of the bale has an impact on the proportion of hay that is in the surface layer with larger bales having less exposed surface as a percentage of total feed in the bale. A 4” layer of weathered material on a six-foot diameter round bale represents 20% of the bale volume while the same 4” layer on a five-foot bale represents 25% of the volume11. In high moisture conditions it is possible to have up to eight inches of spoiled hay on the outside of a round bale. Increased bale density enhances the ability of round bales to shed water. Even, uniform windrows make formation of consistently shaped and dense bales easier. Smaller windrows generally result in denser bales, as there are more layers per roll. Large hard-core bales lose less value than smaller soft-core bales. Selecting the most appropriate type of storage is driven by economics and depends on the end-use for the forage, the specific livestock feeding situation and the needs of the producer. Storage losses can be reduced by two-thirds with indoor storage and by one-half with good covering outside. Main areas of concern are weathering on the tops and sides of the bales but also where the bales contact the ground. Moisture will move from the ground up into the bale through a "wicking" action. All storage sites regardless of the type of storage, should be well drained. A firm base of coarse rock, preferably not gravel or concrete, will help to minimize moisture movement from the ground up into the bales. If possible, avoid areas where moisture and/or snow can accumulate or where drainage is restricted. Storing bales outside on the ground without cover is the cheapest method of storage but has the greatest potential for weathering loses, especially under extended storage periods. Large round bales without cover should be stored end-to-end in single rows in a north-south orientation with space between the bales to facilitate good air circulation and drying. Uncovered pyramid stacking exposes lower levels of bales to increased weathering as rain shed off the top bale row filters into the lower levels. Two-bale "mushroom" stacking where the bottom bale is placed on end and the top bale on its side minimizes the amount of ground contact, but moisture shed off the top bale can accumulate in the lower bale significantly increasing spoilage. There are a wide variety of annual crops that can be cut and baled for use as a feed source. Barley and oats have traditionally been the most widely used cereals grown for harvest as a forage source. Triticale, wheat, corn stover, or peas can also be grown as a monoculture crop or in combination with other cereals for greenfeed production. The traditional recommendation has been to cut cereals for greenfeed at the late-milk to early dough stage. 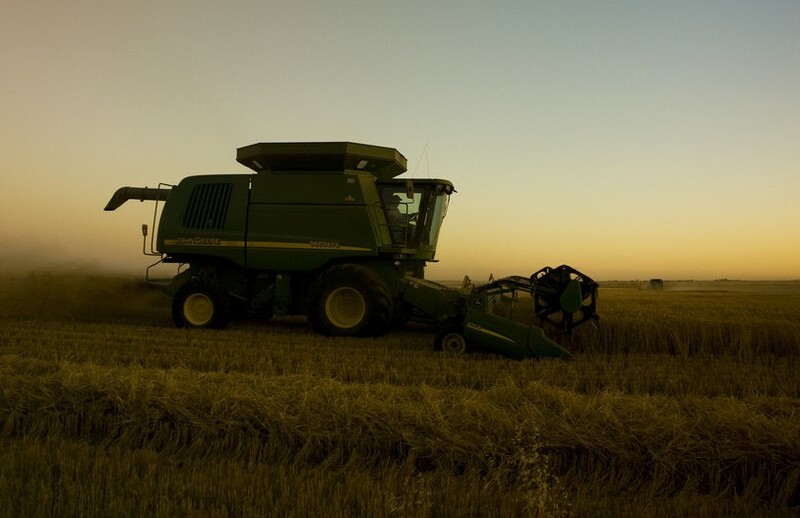 However, more recent research suggests that harvesting oat and barley at the hard-dough stage has the potential to improve forage yield without compromising dry matter intake, feed sorting, ruminal fermentation characteristics or digestibility12. Cautions when cutting at a later stage of maturity include the potential for grain loss in the field due to shelling and the risk that feeding more mature cereal forages may cause acidosis. Generally, annual crops provide a safe and nutritious feed source, but producers should be aware of several possible animal health concerns. Environmental factors such as frost or drought, as well as plant diseases can adversely affect feed quality. Feed testing is essential. Feeding annuals during the winter requires a mineral package formulated to ensure animal needs are being met. Winter tetany or milk fever symptoms are often associated with feeding grain, straw or greenfeed rations. Cereal forages are low in magnesium and calcium and may accumulate excessive levels of potassium that impairs magnesium absorption and causes tetany. Canola can be high in sulfur, which increases the risk of copper deficiency in cattle. Many annual greenfeed crops are prone to high levels of nitrate which can cause death or abortions in cattle. Factors which can increase feed nitrate levels include high levels of soil nitrogen, type of crop, and frost, hail, or drought which reduces or stops growth of the plant causing plant nitrates to accumulate to an unsafe level. Nitrate levels in forages greater than approximately 0.5% Nitrate (NO3) should be fed with caution and carefully managed as part of a balanced ration. When growing barley for greenfeed, smooth-awned varieties are recommended as rough-awned barley greenfeed has been known to cause physical injuries in the mouth which may lead to infections. It is important to watch for lumps on the jaw and consult a veterinarian for treatment. The inclusion of greenfeed within an annual management plan can provide winter feed as well as additional grazing resources as regrowth of stubble from crops grown for greenfeed can provide good quality grazing late in the season. Crops and varieties that have good regrowth characteristics will provide this advantage. Many cow/calf producers have recognized the potential for straw and chaff residues to help reduce winter feeding costs. 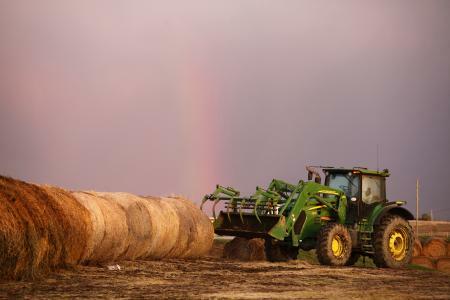 Compared to hay, straw and chaff is inexpensive and is often available as a by-product of annual grain crop harvest, whether from the operation’s own land base or neighboring grain producers. In most cases, straw has a lower energy content than grass hay and is low in digestible protein. Protein must be supplemented in a straw or chaff diet to maintain rumen microbial activity needed for fibre digestion. Diets low in protein lead to lower dry matter intakes, lower fibre digestion and possible impaction. In general, oat straw is better quality than barley straw, which is superior to wheat straw. Year old straw tends to be more palatable than freshly baled straw. Pea and lentil straw have higher levels of protein and energy than cereal straws. Feeding limited amounts of hay will improve a straw-based ration. In all cases, a balanced ration will require the use of added feedstuffs (hay, grain, mineral, etc.) to supplement the straw and ensure that nutritional needs are being met. Chaff is made up of glumes, hulls, unthreshed heads and pods, short straw, leaf material, and whole or cracked seeds from cereal, oilseed and pulse crops. Weed seeds are also a major component of chaff. Chaff can be dropped on top of the straw swath and baled, or it can be collected and blown into a chaff wagon using a chaff collector. Newer technology allows for a complete separation of grain and chaff using one machine. Chaff piles left in the field may be grazed or moved to a central feed pile and fed. Field feeding of chaff is inexpensive, efficient and effective. Chaff pile grazing is preferable to confined feeding due to reduced yardage costs. Farmers should be aware that mats of chaff will remain at the field feeding sites and these areas may suffer from both poor germination and weed infestation the following year if not managed properly. Straw and chaff quality vary with type of crop, stage of maturity, weed content, method of harvest, combine settings, and crop and field variability. The feed value of chaff and straw can be improved through ammoniation or supplementation with protein to improve digestibility. Chaff and chaff/straw type roughages are only suitable for mature animals in good body condition and are best fed as part of a balanced ration to cows in early gestation (first or early second trimester). Yellowfeed is produced when an annual cereal crop is sprayed with glyphosate and allowed to stand until dry. Once dry, it can be cut, baled and used as feed. Significantly lower losses from weathering is the main benefit of yellowfeed because it is left standing to dry, instead of laying the crop on the ground in windrows. 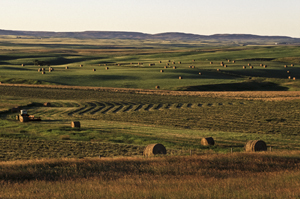 Once the crop is dry, cutting and baling can occur in a single day. A haybine should not be used to cut yellowfeed as it may cause shattering of heads and leaves resulting in lower overall forage quality. Recommendations include spraying the crop five days earlier than when it would normally be cut for greenfeed, as the plants will keep growing for a few days after spraying until the herbicide takes effect. In ideal conditions, a rate of 1.0 L/ac of glyphosate can be sprayed. In wetter weather, increased rates of 1.25-1.5 L/ac are recommended. Drying times range from 12 days under good drying conditions to up to 30 or more days in wet weather. On average, a small increase in yield (10-15%) will occur after the glyphosate has been applied due to short term continued plant growth. In trials, the protein content of oat and barley yellowfeed crops declined slightly (0.9-3.3%) after spraying while the response of total digestible nutrients (TDN or energy content) was variable13. Producers using yellowfeed as a feed source report palatability equal to or greater than greenfeed. A listing of glyphosate products registered for pre-harvest use on livestock forage can be accessed through each province’s Guide to Crop Protection publication. Yellowfeed can also be a management system used in early seeded crops harvested for swathgrazing. Glyphosate will stop plant growth of the crop when desired following which the crop can stand for three weeks or more before swathing. This extended time period prior to swathing, allowing the crop to stand rather than lying in windrows, reduces its vulnerability to summer and fall rains and maintains its quality. This also takes advantage of the higher yield potential of an earlier seeded swathgrazing crop. An additional benefit of spraying a crop with glyphosate for yellowfeed production includes control of perennial weeds. A disadvantage is the elimination of any potential fall regrowth for grazing use. Preserving forage as silage depends on exclusion of oxygen from the forage mass and reduction of pH through bacterial fermentation14. Fermentation is controlled by the type of microorganisms that facilitate the fermentation process, the available substrate (water-soluble carbohydrates) for microbial growth, buffering capacity, and moisture content of the forage crop15. Lactic acid-producing bacteria utilize water-soluble carbohydrates in the chopped forage to produce lactic acid, the primary acid responsible for decreasing pH in silage. Plant proteins increase the buffering capacity of silage. The higher the buffering capacity of forage, the longer it takes to ensile, and more water-soluble carbohydrates are required. Lack of air (anaerobic conditions) prevents the growth of yeast and molds and a low pH prevents the growth of most bacteria after fermentation is complete. Silage can be kept for prolonged periods of time if these conditions are maintained. The ensiling process can be divided into four phases14, 16, 17: 1) aerobic phase, 2) lag phase, 3) fermentation phase, and 4) stable phase (Figure 3). In the aerobic or pre-seal phase, plant cells and microbes metabolize sugars and starch in the presence of oxygen. Naturally occurring aerobic bacteria present on the forage surface quickly begin to degrade the ensiled forage and silage temperature is elevated. During the lag phase, plant cells are broken down providing a food source for bacteria to grow. As oxygen levels decline the active fermentation phase begins and lactic acid-producing bacteria proliferate. These bacteria make use of available plant carbohydrates to produce ethanol, acetic acid, lactic acid and CO2. Acid production reduces pH, creating conditions whereby those bacteria that produce only lactic acid begin to dominate the fermentation process, lowering the pH of the silage to between 4.5 and 3.8. At these low pH values, providing exclusion of oxygen is maintained, growth of all microorganisms is inhibited. The pit or pile must be sealed at least 14 days to complete the ensiling process. Once the stable phase is reached, nutrient quality of the silage can be maintained almost indefinitely. However, upon feed-out, silage is once again exposed to oxygen allowing spoilage microorganisms to become active once again. For this reason, the largest losses in silage dry matter often occur during the feed-out phase18. Figure 3 – Phases during ensiling and storage. Good management practices during harvest and storage are critical to meet the standards for production and maintenance of high-quality silage. Proper moisture content, particle length, packing density and covering eliminates air from the forage mass and encourages proper fermentation. Rapid filling of silage pits, piles or silos and adequate packing are crucial as exclusion of air limits heating and encourages the ensiling process. Silage piles and pits should be covered as soon as possible to exclude air including making sure that plastic is tightly sealed along the sides and edges. Tires are often used to hold the plastic tightly against the top surface. The recommended moisture level for pit silage is 60-65% to increase packing effectiveness and quality. If moisture levels are too high undesirable fermentation bacteria result in nutrient loss and spoilage. Wet silage may also freeze, creating handling difficulties. If moisture content is too low, silage will not pack well. Loosely packed silage holds a greater amount of air which aids the aerobic process resulting in excess spoilage. Forage leaf loss will also be higher when harvesting drier crops, lowering the protein content. Attaining a high density of ensiled forage along with dry matter content determine the porosity of the silage. Porosity, in turn, sets the rate at which air can enter the silage mass and subsequently, the amount of spoilage that occurs during the storage and feed-out phases19. The higher the density, the greater the storage capacity of the pit or bunker. When packing forage, the goal is to achieve a minimum density of 40-45 lbs of fresh forage/ft3 which results in a density of approximately 15 lbs of dry matter/ft3. A guideline for packing is to utilize 800 lbs of packing weight for each ton (2000 lbs) of silage delivered to the pile per hour20. For example, if the harvest rate is 100 tons/hour then packing weight required is 100 x 800 = 80,000 lbs or 40 tons. Each packing layer should be no more than six inches in thickness. It is important to remember that silage can not be overpacked. Silage particle length or chop length is a balancing act between forage fermentation, pit management, feeding and animal considerations. The length of chop affects packing density which affects fermentation of the forage. A short chop packs better than a longer cut and minimizes air infiltration while a longer chop length increases effective fibre in the diet. General recommendations are to harvest cereal, grass and alfalfa at a cut length of 3/8 to 1/2 inch21 and corn at 1/4 to 1/2 inch if unprocessed or 3/4 inch if processed.20 When processed, the plant passes through counter-rotating rolls located between the cutter head and blower of the forage harvester resulting in crushing and shearing of the corn grain, cob and stem. The rate of feed-out of the silage mass must be sufficient to minimize the surface area exposed to the air and prevent the exposed silage from spoiling. An average daily removal rate of 15-20 cm from the silage feed-out “face” (the smooth surface perpendicular to the floor and sides in bunker or pit silage storage) is a common recommendation22. To achieve this, the amount of silage to meet daily feeding requirements is used to calculate the size and face of your silage pile or pit. Annual cereals are a common forage source for ensiling as water-soluble carbohydrate levels are high, buffering capacity is relatively low and moisture content is quite easily controlled. Barley is commonly grown for silage production, but oats, triticale, wheat and rye are used as well. Pulse crops, including peas and fababeans, can be used for silage production. Corn has the greatest potential for silage yields compared to other commonly grown crops. Alfalfa is used for silage production; however, its relatively low water-soluble carbohydrates and high buffering capacity can make ensiling more difficult. Silage additives don’t offset the need to pay attention to the details and focus on good management when putting up high quality silage. The use of additives can accelerate the ensiling process and increase the shelf life during feed-out, increasing net silage value. 2) Fermentation stimulants include bacterial inoculants and substrate suppliers. The bacteria needed for fermentation are normally present on forage tissues; however, under certain harvest conditions there may not be enough desirable bacteria (lactic acid-producing) in the chopped forage for ideal fermentation. The addition of bacterial inoculants (microbials) speeds up lactic acid production and rapidly lowers pH to help prevent protein breakdown in the ensiled forage. This low pH also suppresses the growth of undesirable organisms that can reduce feed intake and nutritive value of the silage. Enzyme additives (substrate suppliers) break down complex carbohydrates in forage into simple sugars, or substrates, that can readily be fermented by lactic acid bacteria. Enzymes can improve silage fermentation when the substrate (e.g., sugars) is limiting. Various combination products containing both enzymes and lactic acid bacteria have been developed. In theory, these additives should complement each other, with enzymes providing additional substrate for the added bacteria to ferment. The desired outcome is a more rapid pH drop and lower final pH. The cost of any silage additive must be offset by possible increases in the feeding value of silage. Enzyme additives are rarely recommended due to variable results and high cost. In all cases, follow manufacturer’s storage and handling directions to ensure product stability. Additives may aid in the preservation of ensiled forage, but employing good management practices is still essential, including harvesting at the correct stage of maturity, moisture level and chop length, rapid filling of pit or pile, and proper packing. These actions will increase the effectiveness of an additive or reduce the need for one. The decision to use a silage additive must be based on its effect on ensiling and resulting livestock performance, as well as cost and return on investment. Bale silage, also known as haylage or baleage, is made by baling high moisture forage using either a conventional round baler or mid-sized square baler and enclosing bales in plastic to exclude oxygen and allow for fermentation to occur. Just as with other systems, quality silage is achieved when lactic acid is produced during the ensiling process. Ensiling bales at 45-55% moisture will provide adequate moisture for fermentation resulting in a final pH between 4.7 to 5.823. These higher pH values compared to chopped silage (pH of 3.8-4.5) are due, in part, to the slower fermentation process of the long fibre forage. As a result, there is generally a lower degree of fermentation in bale silage compared to chopped silage. Forage baled at lower moisture levels will have reduced fermentation resulting in higher pH values and greater chance of yeast and mold growth23. Excess moisture will result in heavy bales that are difficult to handle. Bale size and weight must be compatible with the wrapper, tuber or bag and to the hydraulic capabilities of your tractor. Bales should be wrapped as soon as possible, ideally within five to 12 hours of baling as spoilage increases dramatically if the time lag is longer. Fermentation without oxygen is the goal and this should be achieved as quickly as possible. High quality plastic should be used to seal the bales and maintain an airtight package to minimize storage losses. Bales should remain sealed for at least 20 days for the ensiling process to be completed before feeding to produce a more stable product. Once bales are opened, they have a shelf life of approximately one week. Some systems shrink wrap individual bales which allows for more immediate use of bales once opened. Rows of bales wrapped in plastic are more susceptible to spoilage if air moves down the whole row when end bales are removed. Bale density is an important factor that directly impacts feed quality24. The greater the bale density, the lower the pH and sugar content of the fermented bale indicating proper fermentation under anaerobic conditions. Lower pH helps to ensure long-term stability in the sealed bale. Higher concentrations of both acetic and lactic acid in higher density bales also result in a longer bunk life once bales are unwrapped. 1 Stichler, C. and D. Blade. 1997. Managing for High Quality Hay. Texas A&M, Texas Agricultural Extension Service, College Station, TX. 2 Lacefied, G., J.C. Henning, M. Collins, and L. Swetnam. Quality Hay Production. University of Kentucky, College of Agriculture, Cooperative Extension Service, Lexington, KT. 3 Collins, M., D. Ditsch, J.C. Henning, L.W. Turner, S. Isaacs, and G.D. Lacefield. Round bale hay storage in Kentucky. University of Kentucky, College of Agriculture, Cooperative Extension Service, Lexington, KT. 4 Digman, M., D. Undersander, K. Shinners, and C. Saxe. 2011. Best practices to hasten field drying of grasses and alfalfa. University of Wisconsin-Extension, Cooperative Extension. Madison, WI. 5 Barnes, R.F., C.J. Nelson, M. Collins, K.J. Moore. 2003. Forages – An introduction to grassland agriculture. 6th Edition. Iowa State University Press. 6 Undersander, D.J. 2007. Drying forage for hay and haylage. University of Wisconsin-Extension. Madison, WI. 7 Kung Jr., L., E.C. Stough, E.E. McDonell, R.J. Schmidt, M.W. Hofherr, L.J. Reich, C.M. Klingerman. 2010. The effect of wide swathing on wilting times and nutritive value of alfalfa haylage. Journal of Dairy Science. 93:1770-1773. 8 Morin, C., G. Belanger, G.F. Tremblay, A. Bertrand, Y. Castonguay, R. Drapeau, R. Michaud, R. Berthiaume, and G. Allard. 2011. Diurnal variations in non-structural carbohydrates and nutritive value in alfalfa. Crop Sci. 51(3):1297-1306. 9 Rotz, C.A., S.M. Abrams, and R.J. Davis. 1987. Alfalfa drying, loss and quality as influenced by mechanical and chemical conditioning. Transactions of the ASAE. 30(3):630-635. 10 Undersander, D. 2001. Hay Desiccants and Preservatives. University of Wisconsin – Madison, Forages Division of Extension. 11 Tremblay, M. 2011. Round bale storage tips. Crop Production News. Crops Branch, Saskatchewan Ministry of Agriculture. Vol 33, No. 6. 12 Rosser, C.L., A.D. Beattie, H.C. Block, J.J. McKinnon, H.A. Lardner, P. Górka, and G.B. Penner. 2016. Effect of maturity at harvest for whole-crop barley and oat on dry matter intake, sorting, and digestibility when fed to beef cattle. J. Anim. Sci. 94:697-708. 13 May, W.E., L. Klein, and G. Lafond. Yellowfeed production in Saskatchewan. Agriculture and Agri-Food Canada, Saskatchewan Agriculture. 14 Shaver, R. Silage preservation - the role of additives. University of Wisconsin-Extension, Cooperative Extension. Madison, WI. 15 Kung Jr., L. and J. Nelson. 2001. Management guidelines during harvest and storage of silages. Proc. of the 2001 TriState Dairy Conf., Fort Wayne, IN. 16 McAllister, T.A. and A.N. Hristov. The Fundamentals of Making Good Quality Silage. Agriculture and Agri-Food Canada, Lethbridge, AB. 17 Pitt, R.E. and R.D. Shaver. 1990. Proc. Dairy Feeding Systems Sym. NRAES. Harrisburg, PA.
18 Rotz, C.A., R.E. Pitt, R.E. Muck, M.S. Allen, and D.R. Buckmaster. 1992. Direct-cut harvest and storage of alfalfa on the dairy farm. In: American Society Agriculture Engineers, ASAE Paper No. 921001, St. Joseph, MI. 19 Bolsen, K.K., G.L. Huck, M.K. Siefers, T.E. Schmidt, R.V. Pope, and M.E. Uriarte. Silage management: five key factors. Kansas State University, Manhattan, KS. 20 Lewandowski, R. 2017. Manage for high quality corn silage. Ohio Beef Cattle letter. Ohio State University Beef Extension Team, The Ohio State University, College of Food, Agricultural, and Environmental Sciences. 21 Progressive Forage. 2011. How length of cut affects forage quality. 22 Bolsen, K.K. The silage triangle and important silage practices often overlooked. Kansas State University, Manhattan, KS. 23Alberta Agriculture and Forestry. 2003. Bale Silage. 24 Hall, M. and J.A. Williamson. 2019. Bale density effects on baleage quality. Penn State Extension, Pennsylvania State University, Agricultural Sciences. This topic was last revised on June 3, 2015 at 7:06 AM.